The Vancouver Condo Buzz » Introducing the LOCAL on Lonsdale North Vancouver Condos for Sale – Central Lonsdale High-Rise Tower Residences & Podium Apartments at Extra Foods Site Coming Soon! 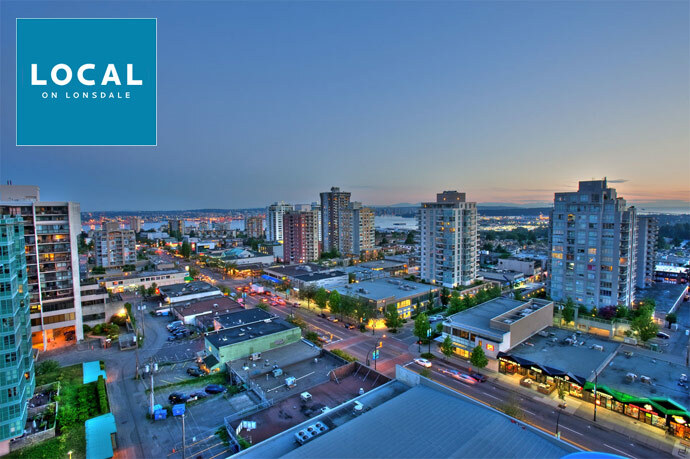 Introducing the LOCAL on Lonsdale North Vancouver Condos for Sale – Central Lonsdale High-Rise Tower Residences & Podium Apartments at Extra Foods Site Coming Soon! ALERT:NOW UNDER CONSTRUCTION! LOCAL on Lonsdale Previews start Saturday November 6th. Visit the interactive presentation centre with a fully furnished 591 square foot 1 bedroom display suite in the heart of Central Lonsdale North Vancouver real estate market. The LOCAL on Lonsdale presentation centre is located on site at Eastern Avenue and 17th Street in North Vancouver. Presales start Saturday, November 13th. Prime Location at the Right Time. The newest Central Lonsdale North Vancouver real estate development is about to launch sales and marketing. Aptly named LOCAL on Lonsdale, these Central Lonsdale condos are located just seconds away from all the amenities, services and facilities that this beautiful and iconic neighbourhood is well known for. Brought to you by Anthem Properties, the LOCAL on Lonsdale North Vancouver condos will be situated between Eastern Avenue and Lonsdale Avenue along West 17th Street (East) and will be built on the current Loblaws Extra Foods site. A combination of a fabulous 20 storey high-rise tower along with a low-rise 6 floor residential building will make up the residential component of the North Vancouver LOCAL condos on Lonsdale Avenue. Featuring true North Shore living, the LOCAL on Lonsdale is not only a residential development by Anthem Properties, but it will also give rise to a mixed use property that integrates new shops, boutiques, public spaces and much more. Not only that, but there will be a brand new 52,000 square ft grocery store as the anchor to this entire block. The future of North Shore condo living is now here at the Central Lonsdale LOCAL North Vancouver condo development at 1575 Eastern Avenue. Some of the initial marketing states that many of the suites will have gorgeous mountain views to the north as well as beautiful city views to the south. Located right in the heart of Central Lonsdale, the residential suites will allow many of the homeowners and residents to walk to everything they need, making true North Shore condo living convenient and smart. LOCAL on Lonsdale, the future of Central Londsale North Vancouver real estate market will be launching sales in the Fall of 2010. Stay tuned for more information and the launch of the presentation centre on site. Call 604.998.0218 for additional details or visit www.localonlonsdale.com as more info is released by the developer. The development team for LOCAL North Shore is Anthem Properties who have been building master planned communities since 1991 and have completed over ninety projects throughout the Lower Mainland. The wait is over! Local On Lonsdale Condos Sales Centre to Start Previews November 6! Preview Anthem Properties’ latest community Local On Lonsdale in Central Lonsdale North Vancouver real estate market. Take this opportunity to explore our fully interactive state-of-the-art 3,200 sf presentation centre with a full 591 sf 1 bedroom display suite right here at the pre-construction North Vancouver Local On Lonsdale condo tower and garden townhomes. In terms of the building, the high-rise LOCAL on Lonsdale North Vancouver condo tower will have an impressive two story grand lobby entrance and the architecture will be striking. 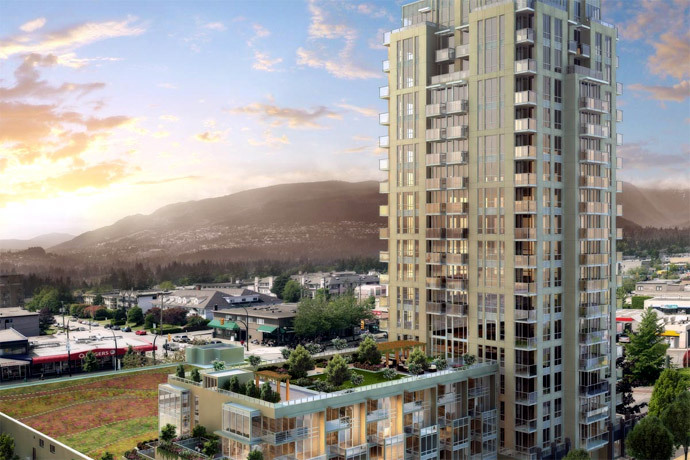 The tower itself will become a landmark high-rise in the Central Lonsdale neighbourhood of the North Vancouver real estate market. In addition, the suites at the LOCAL North Shore condos will have two colour schemes for homebuyers that includes Garibaldi (walnut) and Cascade (white oak). There is efficient hydronic baseboard heating throughout the homes in addition to one inch horizontal blinds, polished chrome finish hardware, stacked front loading washer/dryer and sleek sliding doors in select homes. Also, the new North Vancouver LOCAL condos in Central Lonsdale will present plush carpets in the bedcrooms and enclosed dens, engineered wood laminate in the living room and large windows. The kitchens at LOCAL on Lonsdale North Vancouver condos for sale will introduce luxurious granite counters, contemporary flat panel wood veneer cabinetry, soft closing cabinets, poslished chrome hardware, under cabinet recessed puck lighting and undermount stainless steel double bowl sink. Also, the presales North Van LOCAL on Lonsdale condos for sale will also have American Standard polished chrome faucet with pullout spray, porcelain mosaic tiled backsplahes, garburator and an LG stainless steel appliance set with fridge/freezer, dishwasher, microwave and glass cook top. The bathrooms at the North Shore LOCAL condos for sale will have porcelain tiled surrounds and floors, Kohler dual flush toilet, framless glass shower surround in select floroplans and relaxing American Standard soaker tub. The ensuite bathrooms at the new LOCAL North Vancouver condos in Central Londale neigbhourhood will also have undermount or semi-recessed basins, luxurious granite counters, contemporary flat panel wood veneer vanities and soft closing cabinetry. * Prices and availability of LOCAL on Lonsdale North Shore condos and townhouses are subject to change without notice. This weekend only, the first 50 purchasers will receive up to a $15,000 discount on their purchase at the presales North Vancouver LOCAL on Lonsdale condos and townhouses. ** Visit the Local North Shore condo presentation centre located at Eastern Avenue at 17th Street (off Lonsdale) or call today for more information about our special offers for early purchasers. The presentation centre is open for previews today to Friday from 12 – 5pm and sales this weekend from 9am – 5pm. Explore our fully launched LOCAL on Lonsdale real estate development web site localonlonsdale.com to learn more about this exciting community or call us at 604.998.0219 for more information. *The developer of the North Shore LOCAL on Lonsdale condos and townhomes reserves the right to make modifications and changes to building design, specifications, features, floorplans, promotions and prices without notice. All LOCAL on Lonsdale North Vancouver real estate development renderings are approximate illustrations only and are subject to change without notice. E.&O.E. **This offer will be shown as a decorating allowance on the statement of adjustments and is based on unit type. If you are looking for affordability and convenience, nothing beats the new project at the North Vancouver LOCAL on Lonsdale Avenue condos. Choose from high-rise tower suites to podium level homes, but whichever floorplans you like most, LOCAL on Lonsdale North Vancouver condos are the most ideally situated new residences in this booming neighbourhood. Close to Lower Lonsdale and the Lonsdale Quay, in addition to the local mountains to the north, Central Lonsdale has become a haven for all lifestyles and age groups. From singles and professional couples who work on the North Shore, or who enjoy a short seabus ride into work in downtown Vancouver, the North Shore condo market has been gradually booming because of its affordability, close proximity to recreational activities and facilities and because of the North Shore mountains. Not only that, but the Central Lonsdale North Vancouver real estate corridor is also a hot item for growing families. Here at the Central Lonsdale LOCAL North Vancouver condos, you will find a huge range of floor plans to choose from that are all functional and more spacious than any other project. Anthem Properties has carefully selected the best layouts for you that are designed specifically for low maintenance lifestyles and spacious living. Here at LOCAL on Lonsdale Avenue, you will have the convenience of a 50,000 square foot grocery store, boutique shops and services right below you. Not only that, but community centres, neighbourhood parks, boutique shops, dining, cafes, services, banks, hospitals and clinics are all within a short radius of your new home. In addition, top rated elementary and secondary schools are nearby, as is Capilano College. LOCAL North Vancouver condos are located in the Central Londsale strip that is within a few steps of local transportation routes and is only a 20 minute drive into downtown Vancouver via Second Narrow or Lions Gate Bridge. There are more than 4 green spaces and parks surrounding you, in addition to numerous public recreational facilities. With everything so close to you, who needs a car? This is the best project in the most ideal location in Central Lonsdale real estate market. Enjoy North Shore condo living as it was meant to be. Live at LOCAL on Lonsdale. As mentioned above, the Central Lonsdale Extra Foods site will be re-developed into a mixed use development that will incorporate a 6 storey podium and a 20 storey high-rise tower. With street front shops and a large grocery store, LOCAL on Lonsdale will become the centrepoint for the Central Lonsdale North Vancouver real estate community for generations to come and will make a huge step in the re-development of the entire corridor into a state of the art neighbourhood. The condominium tower is designed to capture the ultimate views of the cityscape and North Shore mountains. The one acre rooftop garden will be the largest in all of North Vancouver and will redefine North Shore condo living at its best. The North Vancouver LOCAL tower floorplate consists of Floor Plan 01 which is a 1104 square foot two bedroom and two full bathroom unit (Type A) which features a large walk in closet and master ensuite with double vanities, walk in shower and separate deep soaker tub. The open style kitchen features a centre island and there are two balconies facing south and west in addition to a beautiful fireplace in the living room. Floor Plan B in the Tower of LOCAL on Lonsdale North Vancouver condos for sale is a 591 sf one bedroom (Type H) plan which features a very long west facing balcony, in suite laundry closet and space for an office niche and a dining area. 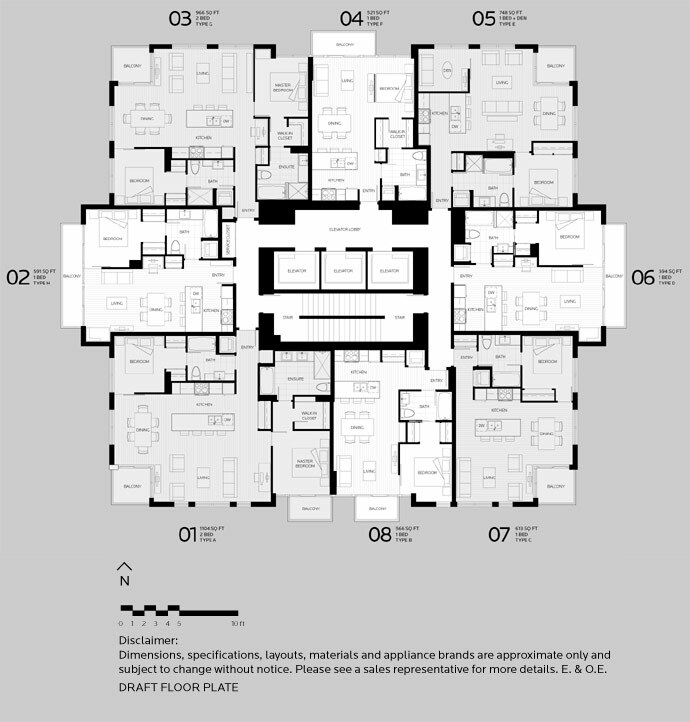 The north facing Floorplan 03 (Type G) is 966 square footage and features 2 bedrooms and 2 baths with a centre island and northwest facing balcony. Also facing north is Floor Plan 04 at North Shore LOCAL on Lonsdale tower with 521 sf studio plan (Type F) with 1 bathroom and compact kitchen. The northeast facing 05 layout (Type E) is 748 sqft and features a 1 bed + den layout in addition to an ensuite with separate tub from shower. The North Vancouver LOCAL tower floor plan 06 is 594 sf and features 1 bed (Type D) with a large living space and east facing balcony. Unit 07 in the LOCAL tower is east and south facing with 613 sf and 1 bedroom (Type C). Last but not least is the south facing bright 08 suite at 566 sf with 1 bedroom, 1 bathroom (with tub/shower combo) and a decent sized kitchen. PLEASE NOTE THAT THESE ARE DRAFTS and not final floorplans. Mark this one on your home buying radar! Twenty storeys of inspired, urban savvy living in one of North Van real estate’s most popluar neighbourhoods is the LOCAL on Lonsdale high-rise tower apartments. Situated in Central Lonsdale North Van’s natural ridge, these thoughtfully designed high-rise condominium homes feature enviable views and a location that’s close to all the things that matter to yhou – boutique shops, dining, arts and cultural amenities, as well as public transportation routes. Plus, just downstairs at the North Van LOCAL apartments will be new shops and public spaces anchored by a brand new forty two thousand square foot grocery store. LOCAL North Van apartments will be found at 1575 Eastern Avenue, North Vancouver. For more information, you can priority register by calling either 604.988.0219 or 1.888.998.0219 or visit localonlonsdale.com for more details. The last study indicated that people who live in North Vancouver are the happiest in the entire Lower Mainland. Well, more people will be even happier as the marketing and sales launch for the new LOCAL North Vancouver condos in Central Lonsdale real estate market starts! Located at Lonsdale Avenue and 17th Street at the site of the Extra Foods grocery store, LOCAL on Lonsdale North Vancouver features a 20 storey high-rise tower and podium that allow for panoramic views of the city, mountains and surrounding community in addition to being centrally located to everything an urban walkable community has to offer. The diverse population that calls Central Lonsdale home can vouch for the more than 130 boutique stores, cafes and dining options that dot the Central Lonsdale North Vancouver real estate corridor, that is very close to both bridges, downtown Vancouver, the Seabus and all of the local mountains for awesome recreational pursuits and facilities. The anchor tenant for the new North Vancouver LOCAL on Lonsdale condos is a 42,000 square foot grocery store on the ground floor that will also feature a select number of other boutique retail stores. Local on Lonsdale North Vancouver condos for sale is poised to shake up the weay you live with outstanding attention to detail and upscale finishes. The marble, limestone, granites and innovative new laminate flooring features a list of high-end finishes that homebuyers can expect to see. The North Vancouver LOCAL on Lonsdale condos also feature an all LG appliance package. Then you add a 7th floor podium garden for residents in addition to a 43,000 green roof, and you can an urban condominium community full of vitality. Also, the North Vancouver LOCAL condo floorplans range up to 1100 square feet and there is a great selection of two level boutique townhouses too. Smart North Shore homebuyers will be flocking to this new Central Lonsdale condo project because of the affordability and the location. The presentation centre is located at Eastern Avenue and 17th Street.